Costa Rica se convirtió en el paraíso mundial para quienes practican la pesca deportiva. La infraestructura de las marinas, vida acuática, montes submarinos y domo térmico de sus aguas, entre otras cosas, atraen una considerable cantidad de especies marinas para generar un ecosistema balanceado lleno de vida. “Podemos decir que el país tiene una riqueza impresionante, es considerado de los lugares más importantes en Latinoamérica”, aseguró Henry Marín, coordinador de estrategia y proyectos de la Federación Costarricense de Pesca (Fecop). Nuestro país ofrece a los participantes especies como pez vela, aguja azul, aguja negra, atún rayado, atún aleta amarilla y dorado, entre otros. “Costa Rica ya casi es la capital mundial de pesca deportiva, ha consolidado su fama y su marca en los diferentes destinos del mundo. Por sexto año hemos sido anfitriones del Mundial de Pesca Deportiva y en coordinación con el Instituto Costarricense de Turismo hemos colaborado para sacarlo adelante”, aseguró Jeff Duchesneau, gerente de Marina Pez Vela. El deporte y el turismo se conjugan para aprovechar los recursos naturales sin dañar el ecosistema. La pesca tipo “catch and release” tiene como propósito liberar a los peces sin dañarlos. Además, el impacto económico en la zona es significativo, generando empleo e ingresos por el comercio. “En promedio, el turista que viene a hacer pesca deportiva gasta diez veces más que el visitante promedio. Un pescador desembolsa entre $1 mil y $1.500 a diferencia del resto que por día gasta entre $100 y $125. El deporte es caro pero las personas que vienen buscan un estilo de vida elevado: querrán comer en los mejores restaurantes y hospedarse en los mejores hoteles”, añadió el gerente de la marina ubicada en Quepos, Puntarenas. En el ámbito meramente deportivo, Fecop inició el proceso para que el Instituto Costarricense del Deporte y la Recreación reconozca la pesca como una disciplina meramente deportiva. Por su parte, la Confederación Internacional de Pesca Deportiva, fundada en 1952 en Italia, con más de 50 millones de miembros de 77 países representantes ya inició con la solicitud con el Comité Olímpico Internacional para la introducción de este deporte. “Nuestra meta es tener pesca deportiva colocada en los Juegos Panamericanos y hacerlo un deporte olímpico tal y como lo es el surf, tenis de mesa o balonmano, que lograron introducirse para 2020. Es hora de que esta disciplina ingrese a los eventos deportivos más destacados”, comentó Carlos Cavero, director de Fecop. Sin embargo, el país deberá trabajar en varios factores para convertirse en potencia mundial. Los intereses de los barcos comerciales de pesca siguen invadiendo la trayectoria de los peces en aguas donde se practica la disciplina y esto afecta la cantidad de animales. La promoción en el extranjero también es un factor que considerar para aumentar la afluencia de extranjeros en el país. Marina Pez Vela hosted the annual Marina Pez Vela Open with a record setting field for this warm up tournament for the Offshore World Championships, which are being held this week at the marina. The MPV open is a two day tournament, open to both participating teams in the OWC as a warm up event and to general entry from local or other international anglers looking to compete against some the international visiting anglers. This year, a total of 19 teams participated in the angling action which featured some intense competition between the top teams with the leaderboard changing every hour in a tight two day race. During the two day event, there were a total of 89 Pacific Sailfish released, 8 Blue Marlin, 18 Yellowfin Tuna and 10 Dorados. The Tuna and Dorado required a minimum size of 15 pounds to be validated and all were weighed at the docks at the end of each day of fishing. Pacific Sailfish were worth 200 points and Blue Marlin for 500 points. The results came down to the absolute last minutes of the tournament with an epic battle which had the first six positions all separated by just one fish. The Marina Pez Vela Open is a qualifying event for the Offshore World Championship so in addition to the prize money, trophy and awards, the team from Miss Judy has qualified for the 2019 Offshore World Championship with their last minute heroics. Team Caliente takes home first place in the 2018 Quepos Billfish Cup. Team Caliente took home first place in the 2018 Quepos Billfish Cup. In total, 12 teams competed in 2018’s 3-day Quepos Billfish Cup, with daily prizes for total billfish releases, as well as largest mahi-mahi and tuna caught during each competitive day of fishing. Top professional and amateur anglers, on some of the most iconic fishing vessels in the country, competed in the world’s richest fishing grounds to crown the winning team. Huge prize money and the coveted invitation to the 2019 Offshore World Championship were on the line. The morning start to the 2018 Quepos Billfish Cup. Special guests at this year’s Quepos Billfish Cup were Team Hatteras, led by the CEO of the Hatteras Yachts, Kelly Grindle. Grindle was accompanied by COO Wade Watson and the sales director for the Americas, Troy Hogan. Team Hatteras fished on Sante, Marina Pez Vela’s own Hatteras GT60, and closely missed the final leaderboard. Marina Pez Vela is a dealer for Hatteras Yachts in Costa Rica. One of the daily tuna winners at the Quepos Billfish Cup. The final results after three intense days of fishing, with teams jumping in and out of the leaderboard, included 149 releases — 9 blue marlin, 1 black marlin and 138 Pacific sailfish. Team Caliente, led by Captain Keith Banks, took home first place with a total of 19 sailfish releases and 1 marlin during the tournament. Second place went to the team Fish Tank with 20 sailfish releases. Game Plan, an early leader, came in third place with 17 sailfish releases and one marlin. 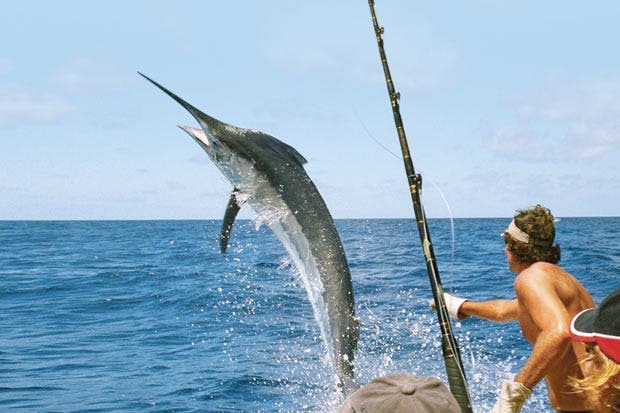 The Quepos Billfish Cup has two divisions: one for large boats and another for small boats. How do you aim to differentiate your tourism service supply? JEFF DUCHESNEAU Our amenities and infrastructure distinguish Marina Pez Vela from others. It is a world-class marina including the docks themselves, which are all floating concrete docks and the sign of a high-quality marina. They are more expensive to build, but are safe, secure, and more resistant to wear and tear. The buildings were built by Portafolio Inmobiliario. We have six restaurants on site, an Italian ice-cream shop, and 30 tour operators. We have a yacht yard and the only 200-ton travel lift in all of Central America. It is designed to haul out boats safely so we can take these beautiful private vessels out of the water to be repaired and undergo maintenance. There are very few places in Central America that can do that. ISABEL VARGAS One differentiator we are trying to develop is wellness tourism. The wellness tourism we want to promote in Costa Rica is not the conventional spa concept. We are not looking at hotels with massage offerings, but a comprehensive service to offer a better quality life experience in contact with nature. We want to include not only the medical component but also activities like mountain hiking, yoga in the forest, picking strawberries, and visiting orchards. This lifestyle experience could be a better healing therapy than traditional pharmaceuticals. We want to offer an authentic experience, where visitors can interact with the people of Costa Rica and nature. This approach is related with a third market niche, which is cultural tourism, the one the chamber wants to work on and promote. Cultural tourism is focused not only on rural tourism but also offering the experience of how we live. Wellness tourism is related to cultural tourism since it is people in contact with other people. It is learning how to live, expand your horizons, and more. We want visitors to open their minds to see and feel differently. We want to sell transformative life experiences. Why should tourists visit and consider becoming tenants at Marina Pez Vela? JD 25% of Costa Rica’s economy is driven by tourism, and nautical tourism is an extension of that. Coming to Marina Pez Vela is to experience the 31 different available activities—onshore or offshore fishing, catamaran cruises, snorkeling, scuba diving, or parasailing to name a few. There is an almost endless amount of tours on offer. Few places in the world have such variety. Number two is the authenticity of the marina and the experience of the town of Quepos, which includes its food, people, and culture. We are also just 8km from Costa Rica’s most visited national park, Manuel Antonio. We have different events like the national volleyball tournament, and a boat parade in December in which 6,000 people from all over Costa Rica participate. It has become an amazing water tourism event and, in the span of three years, has been classified as a national cultural event. Are you more interested in quality or quantity in terms of visitor statistics? IV Bringing in more tourists to our country means more economic activity is generated, leading to more employment opportunities and greater investment due to larger demand. As we get more visitors, the country will boost its tourism income, economic situation, and social economy. If a new minister changes our development model, this distribution will not happen, and I hope the new minister will maintain the current aspects of the model. We want to have a sustainable tourism model that generates economic and social distribution of wealth. That said, we are not seeking mass tourism. We have more to offer, which is why we have focused our marketing on attracting visitors who stay longer and want to know more about the country. Mobility is relatively easy in Costa Rica. Contrary to a recent news report, Marina Pez Vela Quepos meets and complies with ARESEP dispensing and pricing regulation. Our station was most recently certified on July 5, 2016. See certificate of compliance here.